This poem is part of my MFA thesis Time Travel in a Closet, which will be released sometime in the next year. Included below will be a link to an audio file of me reading it on SoundCloud. Well…it finally happened. 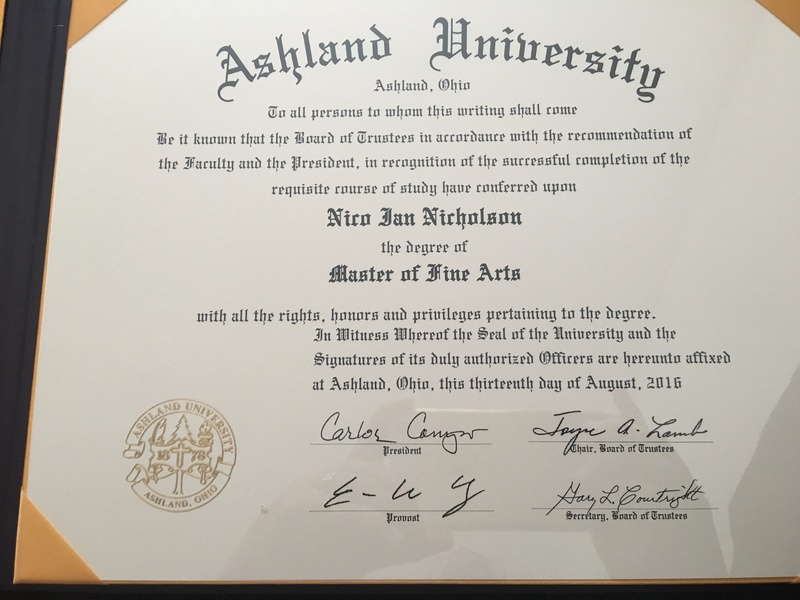 After two years of study, I graduated in July with my MFA in Creative Writing from Ashland University. I can’t say enough good things about Ashland’s low residency MFA program. I worked full time during the two years I studied, and the program was perfectly tooled for people with full time employment, families, and other responsibilities to be able to study and improve their craft. At the same time, the program was rigorous, and exposed me to a wide variety of writers and many different poetry craft styles. I feel a little bit more capable when it comes to revision, and now I have a book of poems that I’ll be shaping (hopefully) towards final publication in 2017: Time Travel in a Closet. In the last few months, I’ve also undergone some major life changes. At the end of May, I left my former job at a major Catholic seminary, at which I had been working for over eight years. About a year and a half prior to actually separating, I began to sense that I should plan for the next stage in my life. Although I only had a small inkling of all of this in late 2014, I was actually planning for a new chapter. Although the mental, emotional, and spiritual signals of needed impending change began to sound off inside me shortly after I began MFA studies, it was another personal revelation that edged me closer to it. In late 2014, I came out as transgender to my life partner Solomon. After that, I slowly discerned through my circle of friends and family and began coming out to those I trusted most. By the time early 2016 arrived, I was “out” in all of my social spaces except for my place of employment. However, I found a couple of coworkers whom I considered to be close friends and whom I trusted, then came out to them as well. I did this because I could not continue to exist there in silence as a transgender man, pretending to be a woman, and frightened out of my wits that I would be outed to administration and then fired. My friends at my former employer were trustworthy and supportive, but as my need to undergo medical transition via hormone therapy and other procedures became more apparent, so did the unmistakable truth that I needed to leave my job. I did what I could to support my family during the year and a half I worked there as a closeted trans person, but I am glad I no longer have to contend with my fears. I am also glad I am no longer part of a wider religious organization that fails to recognize human diversity in all of its forms, and whose spiritual leader refers to transgender people as an “annihilation of mankind.” I still love and value my friends and former co-workers, and am grateful that those who knew stood by me as I finished my tenure there. And as I sensed my time there was coming to a close, I knew I needed to find some other form of income. After some deliberation, I chose to become an independent contractor writing web content earlier this year. I’m slowly learning new things, and I feel much better that I’m in a little better control of my destiny, and that I can provide for me and my partner. To explore my transition journey, I’ve started a brand new YouTube channel. It’s mostly a combination of vlogs, poetry, and me rambling about various neurodivergence, transgender, race, poetry, and other topics. You’ll also get to see and hear me as I change physically over time. Over the summer, I also participated in a long-distance interview over email with Cassie Mira Nicholson. We talked about trans identity, neurodivergence, intentional family, and poetry in the latest issue of The Conversant. The irony is within the last three months of leaving my job, graduating with my MFA, and starting a new career, I also turned 40. The second half of my life is beginning. It’s a little scary, but I’m excited about what it will bring.